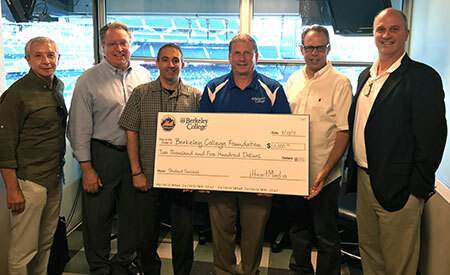 Photo Caption: The Mets Radio Network presents members of the Berkeley College Foundation Board of Directors with a $2,500 donation during a visit to Citi Field in Queens, NY, on August 23, 2017. The donation will assist the charitable organization in providing support to Berkeley College students pursuing quality experiences in higher education. To learn more about the Foundation, visit www.BerkeleyCollegeFoundation.org, email Info@BerkeleyCollegeFoundation.org or call 844-489-5232. Picture above (L to R) are Dario A. Cortes, PhD, Executive Director, Berkeley College Foundation; Michael J. Smith, President of Berkeley College; Josh Lewin, Sportscaster, Mets Radio Network; Kevin L. Luing, Board Chairman, Berkeley College; Howie Rose, Sportscaster, Mets Radio Network; and John Phillips, Board Chair, Berkeley College Foundation, and CEO & Co-Founder, UltraMEND, Inc.
To view a high-resolution version of the above photo, click here.